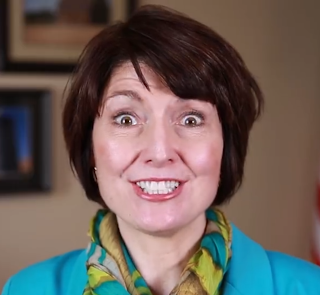 Shallow Cogitations: A Letter From My "Friend"
I received an email with a survey from Cathy McMorris Rodgers. 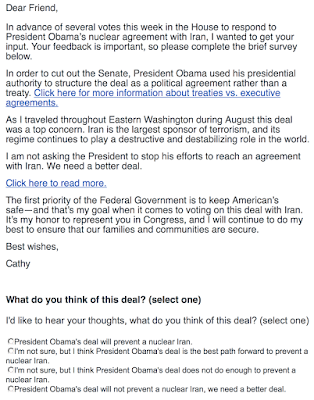 Regarding the Iran nuclear deal it turns out our congresswoman says President Obama cut out the Senate and that we need a better deal. Last of all she asked me to tell her what I thought of the deal. So let's look at how our congresswoman and her fellow members of Congress got here today. Both houses of Congress overwhelmingly passed the Corker-Cardin bill, a.k.a. 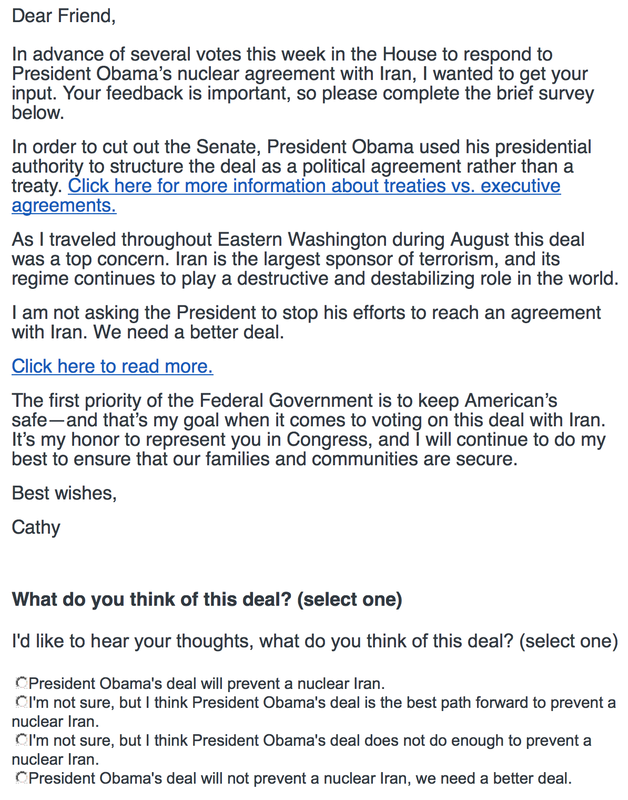 the Iran Nuclear Agreement Review Act of 2015, (Cathy McMorris Rodgers voted yes) which the president signed into law, that required Congress to come up with a veto-proof majority in order to scuttle the agreement with Iran. So basically they tied their own hands. It wasn't easy, but they did it. Congress knew months ago that this was going to be an agreement and not a treaty and they passed the Cardin-Corker in an effort to have a stronger say in the agreement. Now Republicans, including our congresswoman, are falling all over themselves trying to come up with something as they realize they were outplayed, and mostly by themselves. Proudly serving the nut jobs of Eastern Washington. Now that the veto-proof majority is impossible Cathy McMorris Rodgers wants a do-over and says this should be a treaty even though she knew months ago it wouldn't be one.